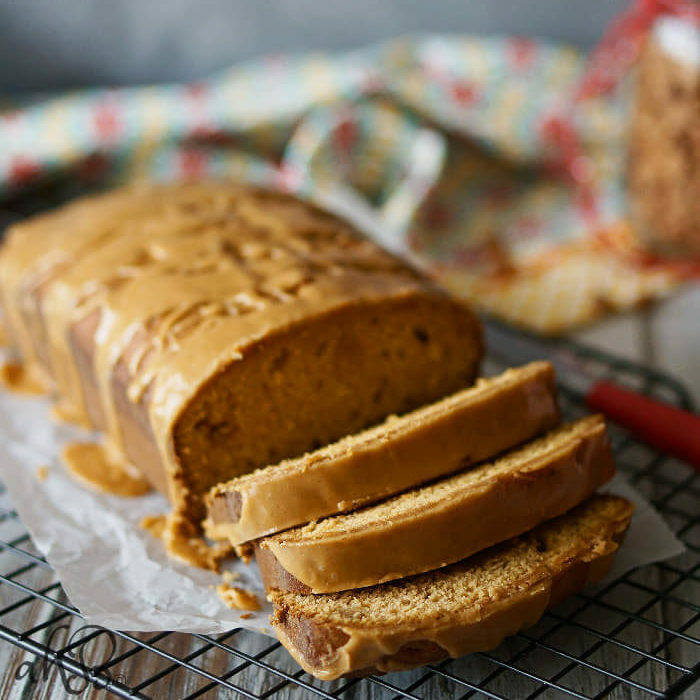 How much butterscotch should you add to a cake? 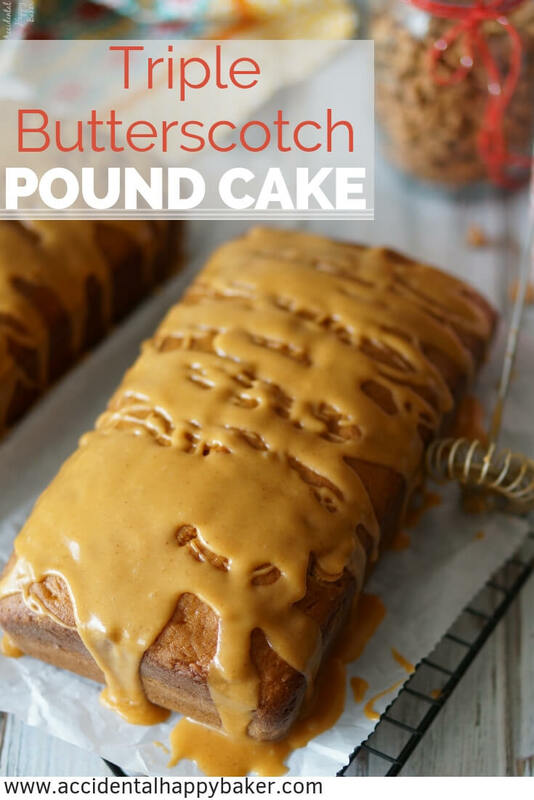 Well my triple butterscotch pound cake has butterscotch batter, butterscotch chips baked inside, and a totally addictive browned butter butterscotch glaze drizzled on top. 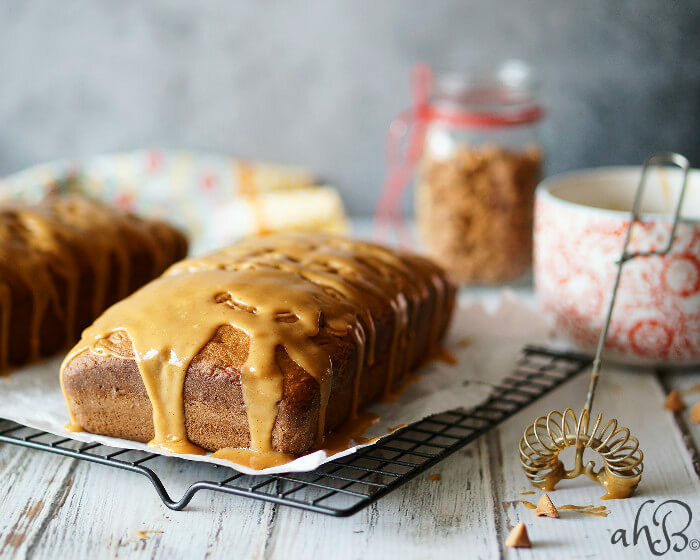 Butterscotch lovers rejoice! This cake is for you. Today’s recipe would not be possible without the assistance of one of my lovely readers, Janet Ligas. Janet was so kind to remind me that I had mentioned this recipe on the blog, but had never gotten around to actually posting the recipe. I’m so glad that she took the time to ask about it because it would be a shame to not share this cake. 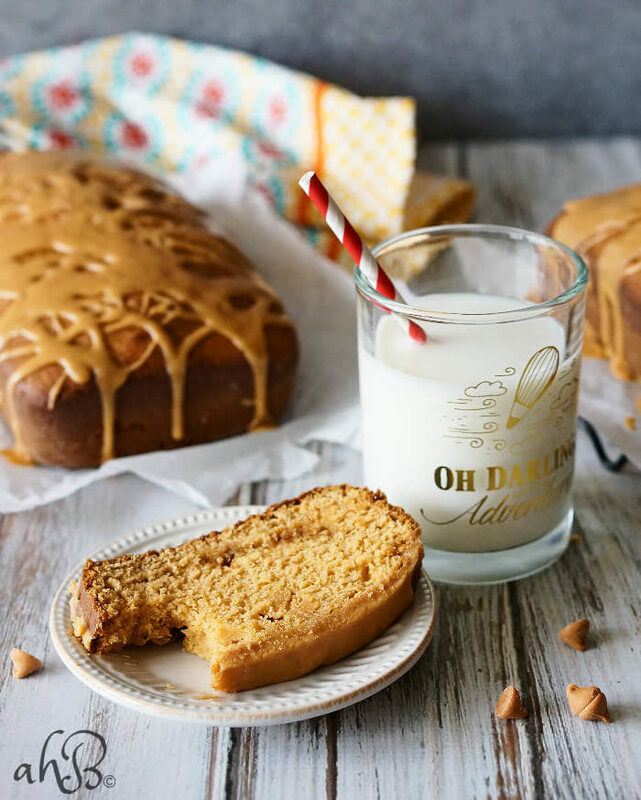 There’s a few key things you’ll want to know when you make this butterscotch pound cake. The cake batter is super thick and will need to be spread evenly in the pan. The butterscotch chips must be layered in between two layers of batter or they will sink to the bottom of your cake, cause them to burn, and make the bottom of your cake stick to the pan. The measurements for the glaze are a little different than most glazes, namely there’s a lot less powdered sugar. This is because the butterscotch chips help it to thicken and set up. A last note here, browning butter is not scary. 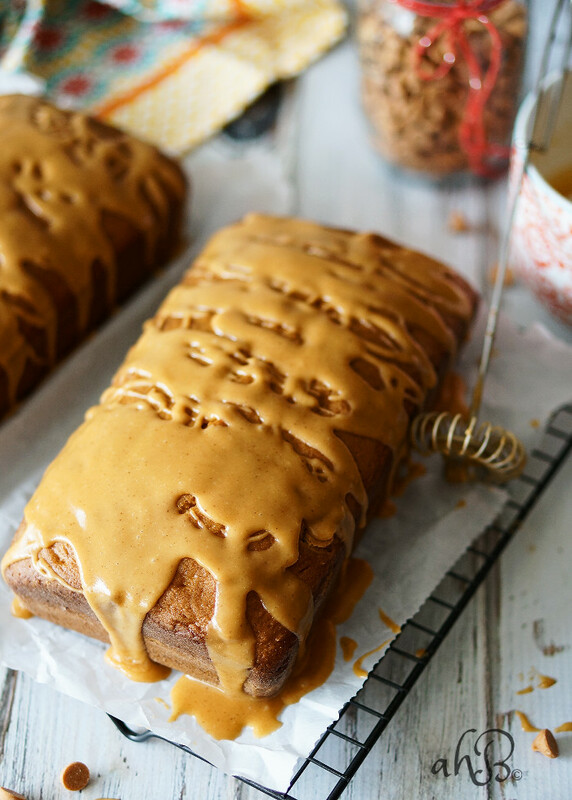 I’m sure some people will go ooooh browned butter butterscotch glaze, that sounds too hard. But really, all you need to do to brown butter is put the butter in a pan on the stove on medium heat for about 8-10 minutes and stir it occasionally. Here’s a link with pictures that show exactly what it should look like. Browned butter adds so much flavor to this glaze! Once you try it you’ll be hooked. 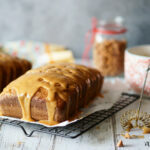 Triple butterscotch pound cake has butterscotch batter, butterscotch chips baked inside, and a totally addictive browned butter butterscotch glaze drizzled on top. In a medium bowl, mix together the flour, baking powder, baking soda and salt. Set aside. In a large mixing bowl, cream together 3/4 cup butter, sugar, and vanilla until light and fluffy. Add the eggs to the mixture, beating in one at a time. Then add in both boxes of pudding mix and beat well until blended, scraping down the sides and bottom of bowl as needed. Mix in the flour mixture and the buttermilk alternately, starting and ending with the flour. Fill each loaf pan to about 1 1/4 inch full of cake batter. Sprinkle the butterscotch chips over the batter and top with remaining cake batter. Bake for 45-55 minutes or until a toothpick inserted near the center comes out clean. Cool the cakes on wire racks for 10 minutes, then remove from pans and cool completely. To make the glaze: Heat 1/4 cup butter over medium heat for about 10 minutes or until browned. Pour the butter into a small mixing bowl, leaving the browned sediment in the pan. While the butter is still hot, whisk in 2 heaping butterscotch chips until completely melted and smooth. Add the milk and vanilla and whisk again. Lastly add the powdered sugar and whisk until completely dissolved and smooth. Drizzle over the cakes. Lovely pictures, especially the first one. This cake looks so gorgeous and delicious. Wish I could grab a slice right now! This looks positively decadent! Lol- my ever slender husband devours anything bad for me before it has a chance to get to my hips.. thank goodness!! How yummy- he’d love this! I’ve got a bean pole for a husband too. But he’s picky about his sweets, so there’s always plenty left for me. Ha! I’ve also experienced the bake-too-much weight gain (sigh!). But that won’t stop me from drooling over this. It looks great! It never stops me either. I’ve got chocolate donuts in the oven right now in fact!